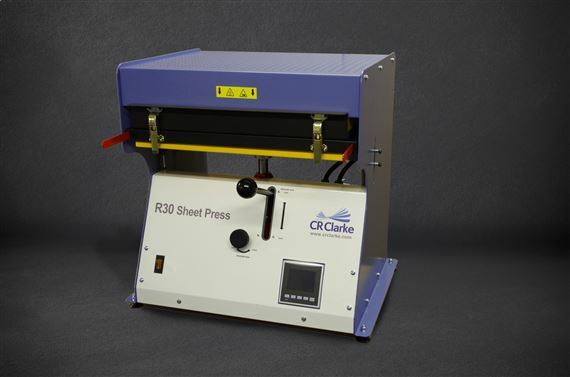 The CR Clarke CRR30 Sheet Press converts granulated thermoplastic material into a usable form using heat and pressure. As standard, the formed article is a flat plastic sheet, which can typically be used for vacuum forming, laser cutting, line bending etc. There are also tools available for making shaped parts, for example Frisbees, on the machine. A removable material cassette is loaded with granules of the material to be pressed. For best results the granules are sprinkled uniformly over the base of the cassette. The cassette is then loaded into the CRR30 sheet press, and clamped firmly between two temperature controlled aluminum hotplates. The heat and pressure causes the material granules to soften and fuse. At the end of the pressing cycle, the material cassette is unloaded and allowed to cool. The formed sheet of material can then be removed and used. Optional stands and cooling fan sets are available for the CRR30. As standard, the CRR30 produces a sheet size that is suitable for use on our CR725FLB Vacuum Former. Other sizes of material can be produced using separately available heating trays.